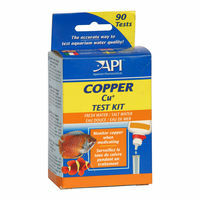 This test kit includes everything you need to measure the general and carbonate hardness of your aquarium water. Monitors GH & KH to create a more natural habitat. Use in fresh water. Testing key water parameters. Identifying problems in an aquarium. Water hardness is a measure of the dissolved mineral content of water. There are two types: the general hardness (GH) and carbonate hardness (KH). When keeping freshwater fish and plants, the GH and the KH of aquarium water should match their natural habitat. 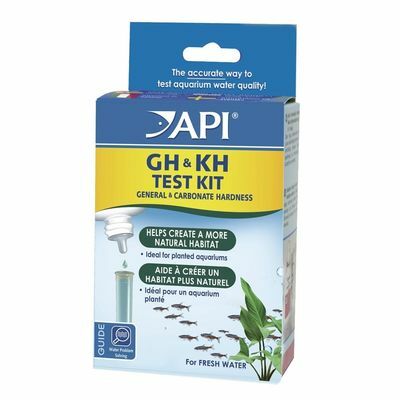 The GH & KH TEST KIT helps aquarists duplicate the natural habitat of their fish, as well as detect low KH levels, which can lead to rapid and wide pH shifts, stressing fish. KH can strongly influence pH. 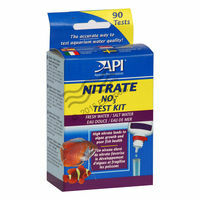 If you add a pH adjuster to your aquarium and the pH returns to its original level in a day or two, this is called "pH rebound" -and causedby high KH. Very hard can cause an ugly white crust (scale) to form on the hood, on glass walls, and on other parts of the aquarium. 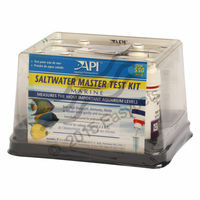 This test kit includes everything you need to measure the general and carbonate hardness of your aquarium water.Benefits:Monitors GH & KH to create a more natural habitat. 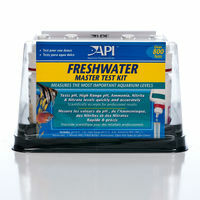 Use in fresh water.Follow the API Easy Care Guide and use GH/KH TEST KIT when:Testing key water parameters. Identifying problems in an aquarium. Water hardness is a measure of the dissolved mineral content of water. There are two types: the general hardness (GH) and carbonate hardness (KH). 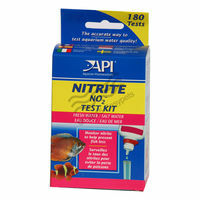 When keeping freshwater fish and plants, the GH and the KH of aquarium water should match their natural habitat. 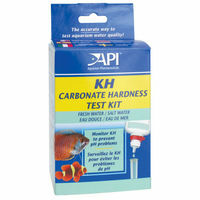 The GH & KH TEST KIT helps aquarists duplicate the natural habitat of their fish, as well as detect low KH levels, which can lead to rapid and wide pH shifts, stressing fish.Tip: KH can strongly influence pH. 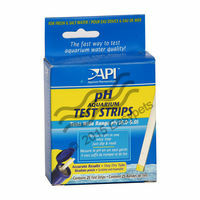 If you add a pH adjuster to your aquarium and the pH returns to its original level in a day or two, this is called "pH rebound" -and causedby high KH. Very hard can cause an ugly white crust (scale) to form on the hood, on glass walls, and on other parts of the aquarium.